We’ve been exploring the First and Second Noble Truths: the existence of suffering, dukkha, and the causes of dukkha. In the Third Noble Truth the Buddha says, hey, don’t worry, there’s a way out of this mess, and that way is the Noble Eightfold Path. So here we are in the Fourth Noble Truth which is the exploration of the Eightfold Path, a comprehensive system of practices that helps us see where we’re suffering and offers very clear guidance to end it. Wisdom practices, panna, are Wise View and Wise Intention. Virtue Practices, sila, are Wise Speech, Wise Action and Wise Livelihood. Concentration practices, samadhi, are Wise Effort, Wise Mindfulness, Wise Concentration. This is the third go-round of teaching the Eightfold Path that you will find on this blog. The first time the aspects were all ‘Right’ — Right View, Right Intention, etc. The second time I wanted to explore the quality of spaciousness that really helps us be able to handle whatever arises in our experience, so I emphasized this by calling the aspects Spacious View, Spacious Intention, etc. This go-round is the first time we are approaching the Eightfold Path coming from the Four Foundations of Mindfulness, just as the Buddha taught it, and together we have been studying and practicing the Four Foundations of Mindfulness over the past year, so this time I think we are ready to give these eight aspects the label ‘Wise’ — Wise, View, Wise Intention, etc. We have earned it! But feel free to refer to posts from any of the previous iterations. They all work together. What is most different about how I have evolved my teaching of the Eightfold Path is the creation of the analogy of a pot sitting on a campfire to help us better understand how these aspects work together, and what role each one plays. Each aspect of the Eightfold Path is a vital part of what makes the whole thing cook. Everything needs to be there — the match, the well laid logs and kindling, the pot, the contents of the pot. If any one of these is missing there will be no dinner! Just so, the Eightfold Path gives us a means to create a happy meaningful life, and a way to see where it’s not coming together. Did we forget the matches? Are the logs misaligned? Does the pot have a crack in it? Did we forget to fill the pot? 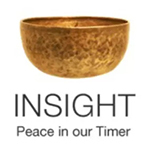 The main difference between the cooking pot analogy and the traditional way of looking at the Eightfold Path is that with the cooking pot analogy, the virtue practices of wise speech, action and livelihood arise as steam as a direct result of the coming together of the other practices. While anyone would acknowledge that this is true, a good case can be made for entering the Eightfold Path by practicing, to whatever degree one is able, these virtue practices. But each teacher must adapt the teachings to his or her students. In my case, I teach a class of women of a certain age who have been practicing their own virtue practices for their whole lives, trying to do the right thing and say the right thing. The challenge for us needs to go a little deeper than simply being nice. Nice we’ve got covered. But there’s a big difference between being nice and being kind in a deep and caring way. So we will be looking at our deep intentions, and questioning how effective we are if our view is unwise, or our effort is unbalanced or our intention isn’t clear, and how skillful can we be if we are mindless. So we will approach these eight aspects in the order that will provide deeper understanding of their interrelated nature, and surest results of wisdom. 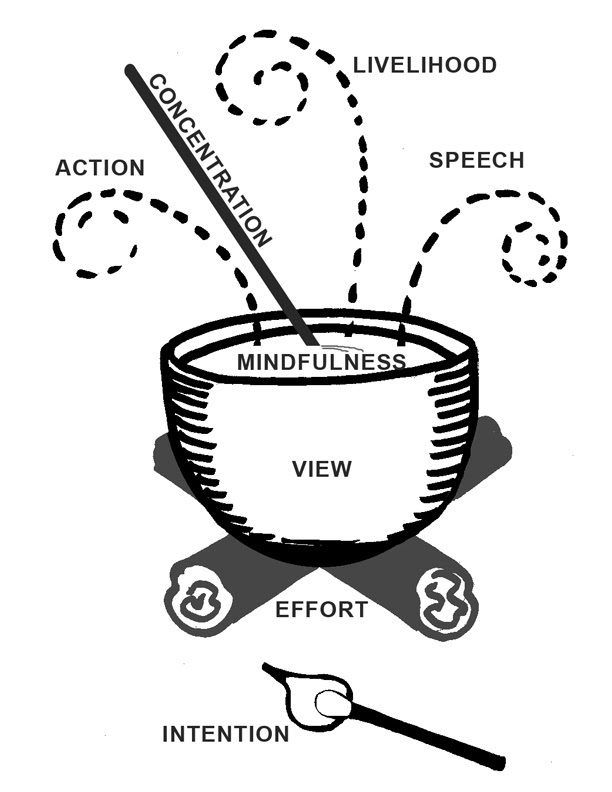 This entry was posted in cooking pot analogy, Four Noble Truths, Fourth Foundation of Mindfulness, http://schemas.google.com/blogger/2008/kind#post on August 18, 2013 by Stephanie Noble. I'm pleased that you are teaching this again, as I wasn't part of the earlier explorations. I always have such good intentions of studying this on my own but never get around to it. So thank you! You're very welcome, Marleen. Funny you should mention intentions, as that is the first thing we will be studying. Good segue to the next post!